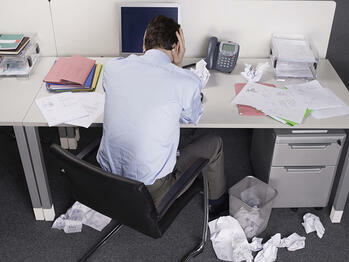 Do you find yourself feeling overwhelmed at work more often then not? Does there never seem to be enough hours in the day to accomplish all of your tasks? Do you not even know where to start on a daily basis? It is possible to make things better. Taking the time to organize your work can make you a more productive employee and improve the overall quality of your life. Here are some steps that you can take to get started. Having a routine will help save you time because it eliminates the need to decide when you will accomplish tasks. The morning is when you are at your most effective, you know, after a cup or two of coffee. Use this time to read and answer your most pressing emails, then begin working on your most important tasks. When mid-day hits and your energy starts waning, you can take a look at those less important emails, set up meetings, and run errands. You promise that you’ll remember that lunch. You know that project’s due date is coming. Then there’s that meeting at two o'clock. But we’re human and things tend to slip our minds, no matter how important they are. When you write things down, you create a spatial relationship within your brain, making it easier to remember things. End each work day by writing down everything you have scheduled and items to be accomplished for the next day. Take this list and organize it by importance or priority. Keep this list within your sight as a reminder when you feel yourself getting off track. It has been shown that taking breaks throughout the day can help you be more effective at work. Now, this doesn’t mean disappear from your desk for hours at a time. Make it a goal to get in at least 90 minutes of solid working time. Then, take about 10 to 20 minutes to get up and move, catch up with a coworker, or grab a healthy snack. In an average 8 hour day, you should only be taking about 3 breaks. Anymore than that and you run the risk of falling behind in your work. Once a week, take time to get rid of everything you no longer need and put the things you do need away. The more often you do this, the less time it will take each week. A clean desk will also help convey a professional image to your bosses and co-workers. As an added bonus, people who keep their workspaces clean have been shown to get sick less often, leading to less missed days. Try splitting those bigger projects into segments and then focus on each part individually. This makes the project less daunting and helps keep up your morale as you complete each part. In addition to managing your own work, don't take on things that you don’t need to. It’s perfectly reasonable to want to help out your coworkers, but don’t do it at the expense of your own tasks and sanity.